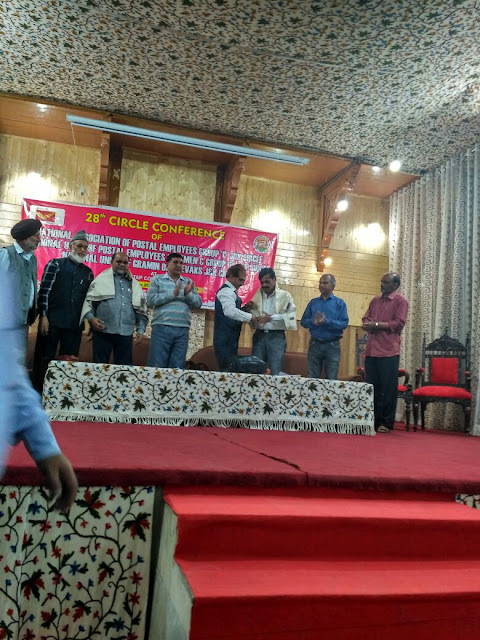 28 Th Joint Circle Conference of National Association of Postal Employees, Group-c, Postman & MTS and NUGDS- J & K CIRCLE held at S P College, the Auditorium Srinagar. From 02-10-2017 to 4-10-2017 under the President ship of Sri B.S Dano Circle President. 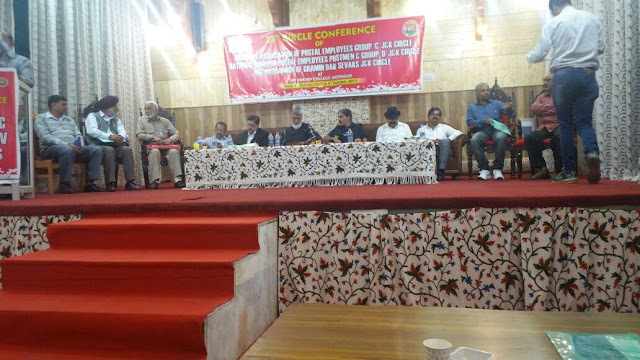 In the open session Sri R.LBhardwaj SSPos Srinagar Division, Sri.C.M.Bhat SPO’s ,Leh Division.Sri Z.A.Mir, Senior Postmaster, Srinagar GPO,Sri Mr. G. M. Shah, ASP West, Srinagar, & senior leaders. G. M. Wani, Sh. 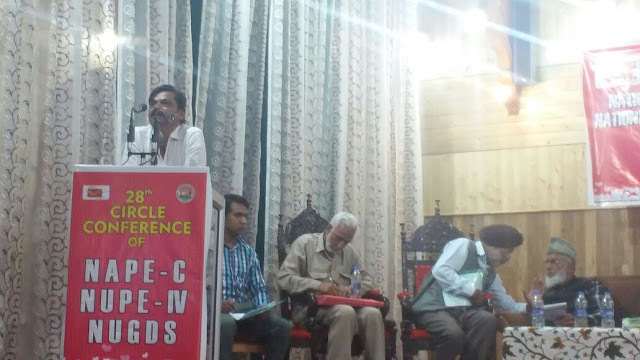 V. K. Mehra, Sh. D. S. Sodi, Sh. A. R. Wani and Mr. M.R.Dar. Sri B.Shivakumar, Asst. 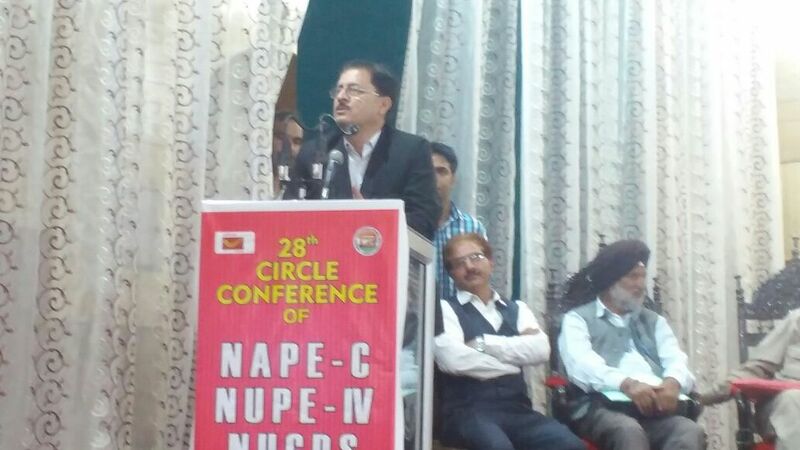 General Secretary NAPE G’C’ CHQ, Sri T.N.Rahta General Secretary PIV & MTS, attended as guests. 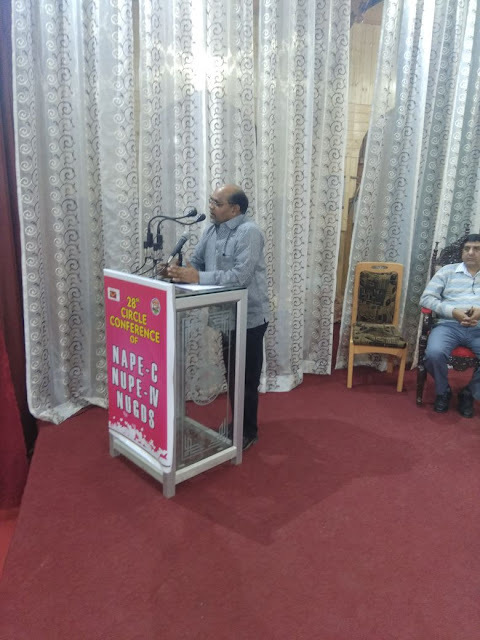 SSPO’s explained latest Developments of the Department, Sri B.Shivakumar AGS Addressed on MACP benchmark, GDS Membership verification, Cadre restructuring, CSI, RICT, Infrastructure problems and other important issues. He also requested C/S take up all the issue pending to four-Monthly meeting with CPMG and Refer to CHQ after that elections were conducted. 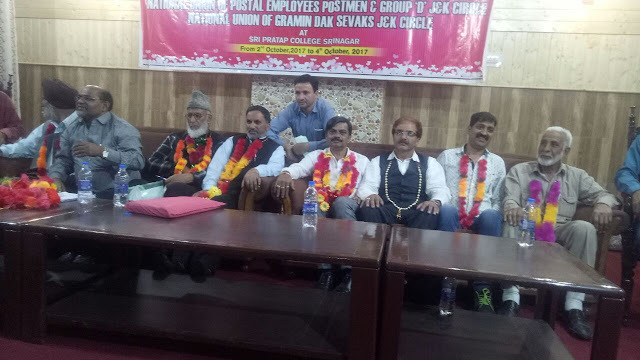 Sri B.S Dano, Postmaster, Udhar, Sri F. A. Reshi, Postmaster Grade I S.R.Gunj PO and Sri Pankaj Pathquid, PA, Udhanpur Division. 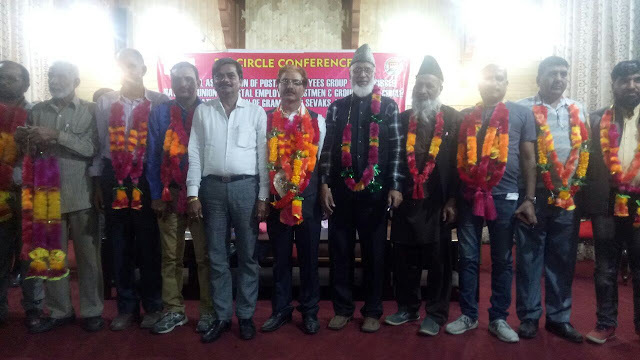 Were again unanimously elected as Circle President, Circle Secretary and circle Treasurer respectively. SRINAGAR division made excellent arrangements to the Guests, Delegates and Visitors. The CHQ conveys best warm wishes to the newly elected Circle office bearers.